We picked five artists from”Terms and Conditions May Apply“, Annka Kultys Gallery, London and asked them five questions about their work on view. “Terms and Conditions May Apply” at Annka Kultys Gallery, London, a group show curated by Bob Bicknell-Knight, to commemorate the launch of the fifth issue of his isthisit? book, includes sculptures, videos, simulations, drawings, paintings and prints from 15 national and international artists, that have made work to explore how and why our lives have become increasingly observed by and mediated upon by corporations and government bodies. “New Empire” is a computer simulation built with Unreal Engine. It’s essentially a self-playing game app, with variables programmed to interact at random and with no limit on its run time. So every time it plays, it generates a unique experience which could potentially run forever. 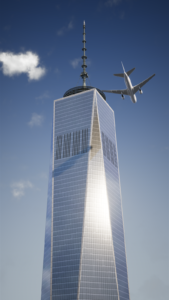 The Freedom Tower is the central element while an endless array of planes fly near-misses toward the top of the tower. When a plane happens to actually hit the tower it bounces off harmlessly, diffusing the initial anxiety of the piece with a sort of comic-relief payoff. I moved to New York in the spring before the September 11th attacks, and I’ve always seen that event as sort of marking the official start to my adulthood. It’s informed much of my worldview. Walking around the city, I often look up at all of the tall buildings and I can envision the same thing happening again. Not that it’s traumatic for me, just a reminder that not really much has changed and that little was learned. Using the Freedom Tower specifically here is a direct comment on the hubris and false sense of immortality that are so linked to patriotism here in the states – the new tower was built in practically the same spot of the original towers (but taller! 1776 feet, so symbolic!). But more importantly, that era set many global forces in motion which bring us to our current national and global situation. As mentioned above, the visuals are completely computer-generated. All of my work for the past 15 years or so has been made using various 3D modelling, and rendering software. The tower and the planes were modelled and textured using Blender 3D, and then imported to Unreal Engine to program the interactive elements. It’s meant to play on a large screen or projection, and for this show it will be the first time it’s presented on an over-size screen. The main struggle for me was making the leap into real-time motion visuals, and programming for the interactive elements. Most of my previous work has been rendered out of the 3D software as static images and shown as large-format prints. My background is originally in painting, and I still tend to think of composition and imagery in those terms. The “narrative” or time-based structure of animation feels relatively foreign to me. I have done other short animated pieces, but this was my first attempt at the added aspects of real-time generative elements and interaction. Not sure about a “purpose”, but I guess I see the piece as a meditation on the absurdity of our current nationalistic moment. I say meditation, because I feel like the visuals actually produce a sort of detached, hypnotic effect after a while of watching. In an age of hyper-connectedness and information overload, that effect is unexpectedly calming (despite the nature of the visuals). The illusion of danger is countered by the illusion that nothing can harm us. In a broader sense, the more “connected” we are through technology, the less connected we are to reality. I think that contradiction is an important factor in all of my work. As I was looking for an answer online (to solve a very specific problem I have now forgotten), I ended up on finding myself on wikiHow.com – an online wiki-style community consisting of an extensive database of how-to guides. Founded in 2005 by internet entrepreneur Jack Herrick, the website aims to create the world’s most helpful how-to instructions to enable everyone in the world information on how to do anything. While crawling among the numerous tutorials, I started to fantasise about the idea of someone raised with internet as its mainly source of knowledge, and who could do almost anything from « how to tie your shoes » to « how to change a tire » – without needing any friend or family to teach him/her. But how would that person learn about abstract human feelings or skills such as caring or forgiving, only with tutorials? With its weird entries and its uncanny-valley deadpan illustrations, the whole wikiHow website sometimes look like a strangely cold parody of human knowledge. 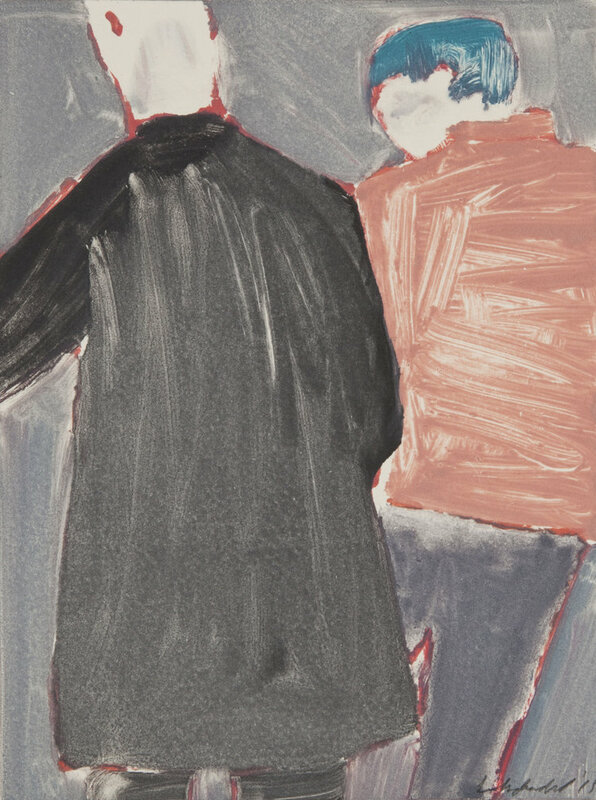 Imitating its rotoscoped aesthetics, How to (Learn Online) is a series of outsourced drawings illustrating verbs such as remember or forgive, becoming a visual guide for those who would need to empathise with those notions. 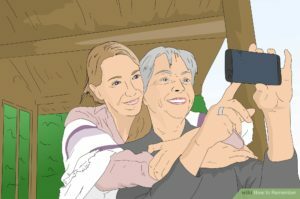 As part of “How to (Learn Online)” series, “How to remember” depicts two women taking a selfie with a phone. Printed on an iPad case, it functions as a reminder for not forgetting to digitally archive your most precious moments. 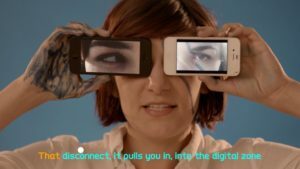 “How to (learn online)” series deals with loneliness, self-learning, and diverted transmission of knowledge, while “How to remember” specifically deals with delegation of memory, and digital archive. What you archive with your phone ends up defining you – from this selfie posted on social media to metadata collected by corporations. What you want to remember will not be erased, for those data and images to constitute a digital portrait of yourself. Seen from the outside, those archived and shared digital memories are an overview to human knowledge and logics. Using tags, I selected stock images and outsourced drawings based from a particular illustrator. Once received, I added them to the wikiHow watermark, and then ordered the iPad cases on an online store that makes custom phone cases. In the end, everything was done from my computer. It was a pretty smooth workflow, from the selection of the images to the production of the object. Create an abstract situation where feelings would be analysed from an experience-less point of view. If an AI would crawl wikiHow, would it learn about empathy, would it be able to experience such a complex feeling? of extremely fast and complex interconnected and automated networks. The artwork features a video running on LED matrices, displaying a data visualisation of Facebook-related news, published online on the day of the crash. It focuses on our society having become slave to the same technology we created, and can no longer fully understand. 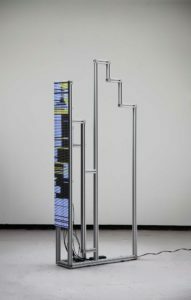 The sculpture is made out of extruded aluminium profiles arranged together and connected to LED matrices. These are managed by a micro-controller, through a custom code, and powered by a web of cables. The aluminium is of the same type, conventionally used to build temporary workspaces and structures in factories. I like to think of it in relation to the contemporary quality of labour and production of value in our society. It is also a reference to the way algorithms and automation in general, are already replacing humans in the job market, a phenomenon that will only increase in the future. The estimate is between the 35-40% of UK jobs going to be affected and/or replaced by automation, over the next 20 years. In this respect, I am very interested in what will happen next, especially with regards to the individual (in example the prospect of implementing basic income policies) and overall in trying to imagine how capitalism will be changing as a consequence of artificial intelligence technology. My artistic practice is mainly research-based; I spend lots of time reading books, papers, listening to or attending talks, on and off-line. I guess that my personal struggle is with understanding the limit between procrastination and action in artwork production. Many of my works are the result of collaborations with engineers, designers, researchers, perfume makers, data analysts, and fortune tellers. Borrowing elements from the non-linear process of Design Thinking, such as Ideating, Prototyping and Testing is helping me a lot. Concepts like ‘Just start building’, ‘don’t spend too much time’, ‘Remember what you’re testing for’, and finally ‘improve and craft” are crucial elements of the disciplines of Design and Engineering, and can also be transferred to art practice – and be used to facilitate and make a big difference in artwork production. representational model of the political, social and economical aspects of our society, and of the culture and values it promotes. Deep inside, my main interest is to try and gain an understanding of the way notions of faith and belief are produced and shared, across individuals and large corporate systems. The artworks in this respect function as a network of interrelated elements, a system where concepts, materials – both physical as metal, paper etc. as well as intangible, such as data – are meant to bring to life connections and meanings that would otherwise remain intangible and hidden behind the construct of our society. We were thinking about objects for self-protection designed for the masses. For people who are at the same time reliant on and oppressed by these worldwide enterprises; e.g. Nike, McDonald’s, Facebook. Although at face value, the images of the weapons are blatantly consumed as a critique of the social media platforms on which they are spread, as well as other companies, they inevitably function as a form of promotion that could even be mistaken as an example of astroturfing. Thus, we’re not able to truly critique these large corporations, but only point to our boredom with their ubiquity. These banal symbols define the majority of mainstream visual language. This is what we have to work with, given the type of shallow images we aim to create. The piece is actually the viral photograph of the weapon, which was shot as if it were an ad or a sponsored post. The physical Corp Gear weapons can be thought of as a props, all of which were fabricated in New York by Brian Yudin, using various metal working techniques. 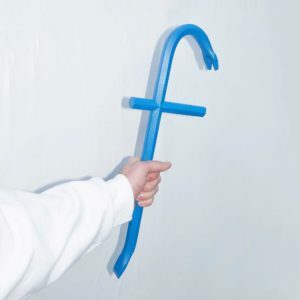 The Facebook crowbar was welded out of heat-treated carbon steel and painted blue. Deciding on what types of objects to combine with the logos – some ideas were pacifiers and baby toys, tessellated military uniforms, sceptres, or analog navigation tools. We chose weapons because we are appealing to a mainstream audience, and we want viewers to feel artificially empowered, not ridiculed or anxious. The weapons were designed in order to produce meme-like images, where they can be shared and appropriated freely to have the maximum impact. Although they are all functional weapons, I’m not sure who they could be used against, physically, besides maybe oneself. We don’t endorse stabbing Mark Parker or beating Mark Zuckerberg with a crowbar. Blue-collar crime can’t be used against a system. We’re not offering any promise to produce measurable change, only a play on protest. Original music was written with Michael Jon Hancock, and since this is a short film, at least 30 people gave their time and love to help us make this. Independent film is very hard because of the expensive nature of it. Also, we made this work in 2013, so it was sort of hard to explain and entertain at the same time. Some of the concepts in this film were hard to discuss with a general public at that time, but now already feel outdated. That’s why we tried to focus on the human nature and emotional response of the complications of moving forward to a more technological-infused time. Getting the colours right was the biggest struggle with this painting. The dress pattern changed a lot during the process. Also, the colour of the concrete golf structure went through quite a few changes. It was also trying to get a sense of realism, but allowing strong abstract elements to dominate the image. 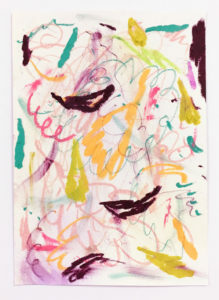 It was part of a series of “feet” paintings. This was the only square one, so the shape provided different challenges. To sort out some complicated thoughts about the cloud and life. It was a companion piece to this art show.